One-Click Installs — Opens the One-Click Installs page in your panel, where you can install and manage WordPress and other apps. DreamPress — View signup information and general info about your DreamPress site. Resources — View additional resource products to further enhance your DreamPress site. 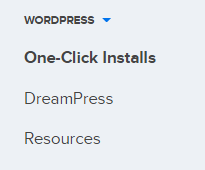 If you are looking for a basic WordPress installation instead, view the 'One-Click Install' article.